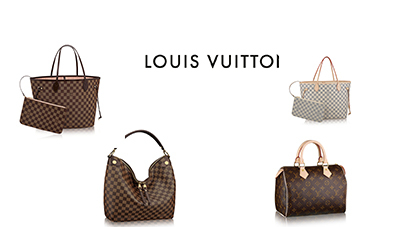 Louis Vutton or LV in short is one of the most established brands in the world of luggage, women handbags and accessories. The logo and acronym is one of the most reputable brands in the world which have been made popular by celebrities and prominent figures around the world. LV is a division of the holding company LVMH or Louis Vutton Malletier Holdings. The brand is one of the oldest brands in the fashion industry with a history that dates back to 1854 by Louis Vutton himself. The brand originated from Paris in France when the designer introduced his range that include flat-bottom trunks made using trianon canvases. From its humble beginnings in France, today it has one of the largest network of stores around the world which carry all types of fashion related products like jewelry, accessories, sunglasses, shoes, watches, ready-to-wear apparel and most notably, handbags and bags. It is also involved with books which are all sold through their standalone boutiques which are usually placed in prominent locations and easily distinguishable. Today, LV continues to establish itself as a permanent fixture and player in the fashion industry in the global market where it is also actively marketing its products and brand image in regional segments too. So good are the successes of LV that they have extended their influence in the Asian market where they have stores now in the likes of Shanghai and in the major shopping cities like Singapore, Hong Kong and in Malaysia. In Malaysia, LV has been working relentlessly to curb those who are manufacturing and importing fake LV handbags into the country to be sold in several shopping malls as well as in the markets. There are 3 original stores operating in the Klang Valley with the most prominent one being in Starhill Gallery along the main road of Bukit Bintang. The other 2 stores are located at Suria KLCC and at The Gardens in MidValley Shopping Center.